Just off the A43 and A46 highways, the hotel is ideally located 5 minutes from Eurexpo Lyon and the St Priest and Chassieu business parks. 10 minutes from both Lyon-St Exupéry airport and Lyon's TGV train stations. Perfect for your family vacations, our h otel offers a restaurant, bar, swimming pool with terraces, garden and fitness room. For your business seminars and conventions, the hotel has 14 meeting rooms for 10 to 330 people. Free secure car park. Spacious, contemporary design and adaptable, the Novotel room is truly a place for living. Perfect for all your needs. 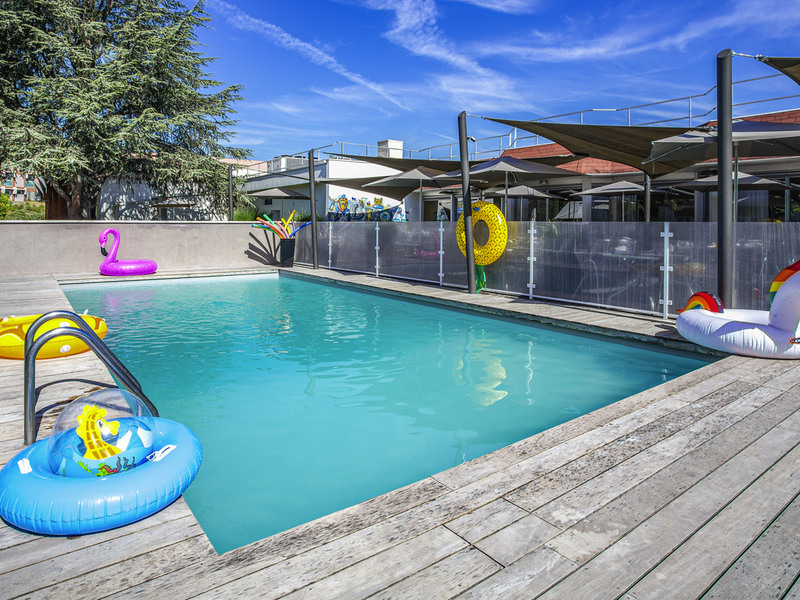 The rooms at the Novotel Lyon Bron are ideal for families, with a double bed and sofa bed for 1 or 2 children. Option of rooms with shower or bathtub, and separate beds. Connecting rooms available on request. A modern interpretation of the traditional French brasserie. Lively at all times of day, our restaurant offers simple, high-quality gourmet cuisine with regional influences in a relaxed setting with an open kitchen.